You don’t need a ton of floorspace or high-end add-ons to make your bathroom the best it can be! Sometimes, the best bathroom remodels are the ones that redefine the space you already have. Take this recent bathroom remodel for example. A husband, wife, and their newborn baby were tired of living with their 20-plus-year-old bathroom. It was small and had no flow; what little space existed was taken up by a clunky hot tub and stand-up shower. The old brass fixtures were dated and the two undersized, 24” vanities were simply not working for the couple. As this job was to take place in November and was slated to finish by Christmas, time management was crucial. In addition to the project’s time constraints, we had a couple more challenges to overcome when it came to this particular remodel. For one, the wife was very apprehensive at the thought of hiring a remodeler because her previous remodeling experiences had been bad ones. The other challenge was turning the home’s original builder-grade construction into a high-end luxury bathroom that also worked with the family’s budget. Piece of cake! After removing the old hot tub we were able to redesign the space and create custom “his and her” areas with enlarged, relocated vanities that gave both flow and functionality to the room. 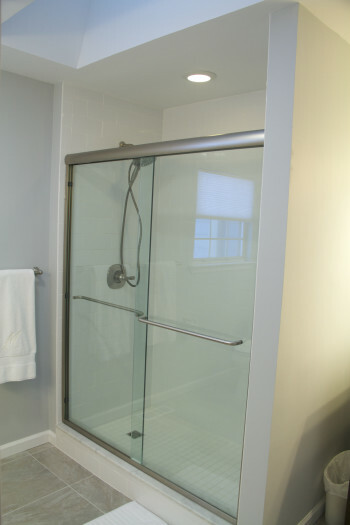 After providing the couple with guidance in regards to what kinds of plumbing fixtures to buy and where, we were able to successfully match the satin nickel trim finish they chose to the shower door, shower faucet, and bathroom fixtures—down to the toilet flusher handle and towel racks. 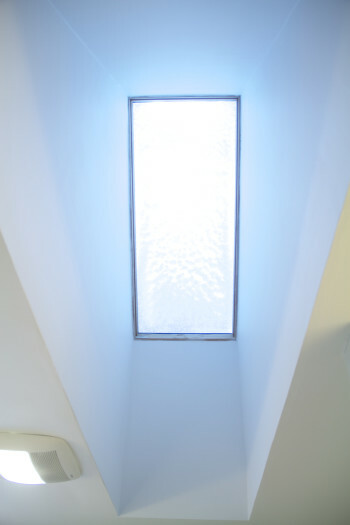 All told we ended up installing totally new plumbing, rewiring for hi-hats and light bars, putting in a skylight, and installing a ventilation system complete with a light and nightlight (for when the baby gets a little older). The bathroom remodel was a complete success! We finished in just four weeks with plenty of time left before Christmas, and that’s including a one-week break where the couple was out of town and requested no work be done. 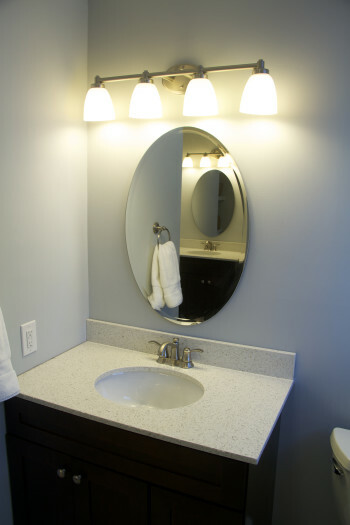 When the moment of truth came and the newly-remodeled bathroom was presented to the couple, we couldn’t have been more pleased with their reaction. The wife was thrilled with the job, the new bathroom was an exact recreation of what she had pictured in her mind. 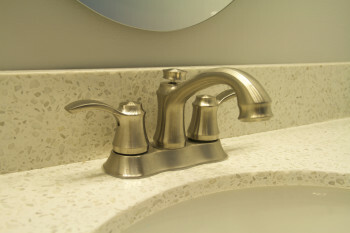 Both husband and wife were pleased with the finished product and improved functionality and flow of their new bathroom. Contact Spence Residential today by calling (610) 960-0788.